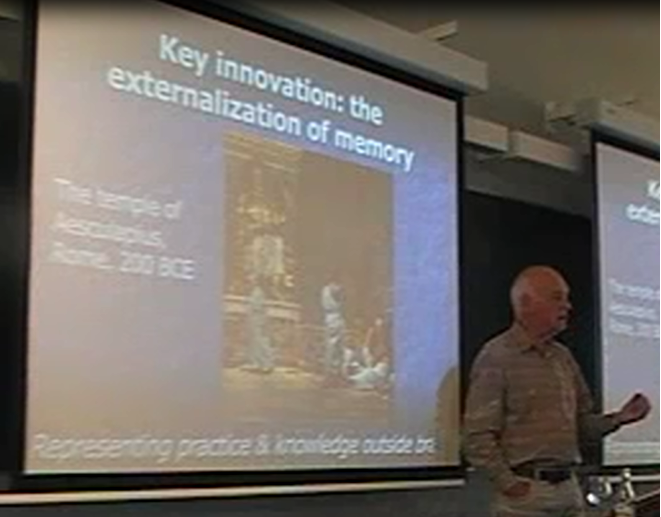 'The impact of material culture on brain, cognition and consciousness'. Lecture given by Merlin Donald at Lund University on September 16th, 2009. The storage and retrieval aspects of human memory have different evolutionary origins, with voluntary retrieval evolving late, and quite recently. Memory storage, including episodic recognition, seems similar in primates and humans, but voluntary memory search and retrieval is found only in humans. This core capacity may be called "autocuing," or the self-triggering of specific memories. Autocuing does not appear in our closest primate relatives, chimpanzees, and was thus probably absent in our common ancestor with them. It appears to have emerged in hominids in two stages. The first stage appeared in the form of a capacity for voluntarily rehearsing nonverbal skills, especially toolmaking skills. This capacity entails the creative pantomime of previous actions, towards their refinement -- mimesis -- and is contingent on voluntarily searching for, and retrieving, specific previous performances from memory. The second stage in the evolution of autocuing came with spoken language, during the last 400 thousand years, and appears to have been scaffolded on mimesis. The neural mechanism of autocuing appears to be supramodal, and linked to the mechanisms of voluntary movement.